Immaculate conception! Facial hair! Racist doctor! Space Whoopi! Pulaski starts in on her Data hatred right off the bat. She wears her bigotry on her sleeve. If Twitter were still around in the 24th century, she’d be trolling him pretty hard. Ten Forward is a great set. They really needed a big open space for people to converge. 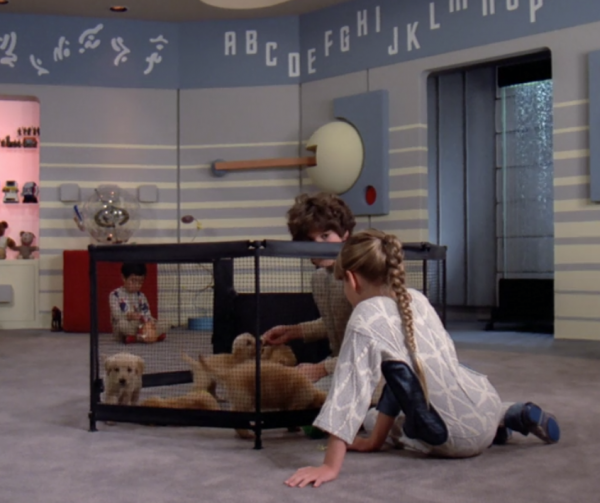 And since when does the Enterprise have a puppy room?! Tinkerbell never heard of affirmative consent. Wes and Guinan have a heart to heart. Troi saying goodbye to her son/alien. Growing up, letting go, and making tough (unexpected choices). 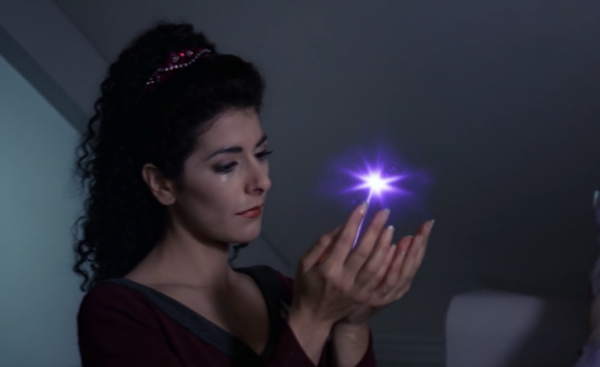 They spend a lot of time with Wesley’s B story about whether or not to stay on the Enterprise or go out into the world, cutting short Troi’s exploration of her unexpected child. The writers were clearly still figuring things out, and giving Troi a baby opened up more possibilities for her character, who didn’t have much to do in season one. But don’t worry, that lesson will be forgotten shortly.